Michelle Wildgen author of Bread and Butter Author talk & book Signing Thursday, April 10 at 7:00 p.m. Books & Company Britt and Leo have spent ten years running Winesap, the best restaurant in their small Pennsylvania town but are thrown off-kilter when their younger brother, Harry, opens his own hip little joint. Britt becomes fascinated by a customer. Their pastry chef, Hector, quits and reappears at Harry's restaurant. And Leo falls for his executive chef. Filled with hilarious insider detail, Bread and Butter is both an incisive novel of family and a gleeful romp through the inner workings of restaurant kitchens. Michelle Wildgen: Madison based author is the executive editor of the literary quarterly Tin House. A graduate of the University of Wisconsin, Wildgen received her MFA from Sarah Lawrence College. 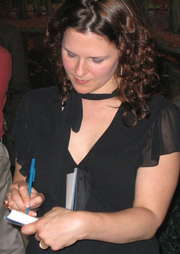 Her fiction, personal essays, and food writing have appeared in The New York Times; O, The Oprah Magazine; Best New American Voices; Best Food Writing; Prairie Schooner; and elsewhere. Michelle is the author of the novels But Not for Long and You're Not You, and the editor of an anthology, Food & Booze: A Tin House Literary Feast. You're Not You has been optioned for film by Hilary Swank and Denise Di Novi. Michelle Wildgen - Author of "Bread and Butter"
Madison author and co-founder of the Madison Writers' Studio, Michelle Wildgen, will discuss her latest novel "Bread and Butter". Michelle Wildgen , You're Not You. Michelle Wildgen is currently considered a "single author." If one or more works are by a distinct, homonymous authors, go ahead and split the author. Michelle Wildgen is composed of 4 names. You can examine and separate out names.